Navy beans are also known as pea beans or haricot beans. It is an extremely common type of beans that is resilient enough to grow in bushes and vines. 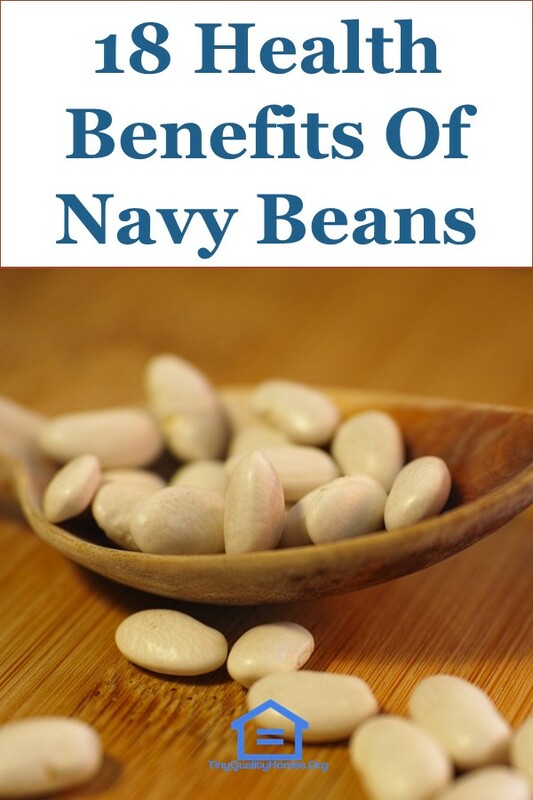 The “Navy bean” name was obtained from the prevalent use of this particular beans by the United State Navy as part of a staple diet for sailors. Navy beans high nutritional value and its ability to be preserved for long periods without losing its nutritional value make it very valuable when compared to other legumes or vegetables. Regular consumption of navy beans can reduce the risk/occurrence of heart attacks, blocked arteries, strokes, and other vascular diseases. This is because the beans are not only low in fat content, but also because they are high sources of folate, magnesium, and dietary fiber. The beans are also helpful at improving blood flow in the body, and in strengthening your heart. Navy beans are helpful for diabetics and the obese. This is because it’s a food that has a low glycemic index. This, in turn, means that there is a minimal increase in blood sugar levels after eating the beans. This not only helps in weight control but also reduces the risk of heart attacks and diabetes. As navy beans are full of dietary fibers, the digestive process is improved, which in turn helps treat various digestive problems like constipation and irritable bowel syndrome. The beans also indirectly help with weight loss as its fibers keep you feeling full for a longer time Your feeling full reduces the need or urge to snack or binge in between meals. Navy beans are one of the foods that are rich in potassium and iron. These minerals are both important for your hair growth. Potassium helps by reducing and in some cases, stopping hair fall. In the case of iron, it helps trigger hair growth. Besides, the nutrients of the beans help vitalize and ensure your hair is maintained in a good condition if eaten regularly. Navy beans are also rich in copper, a mineral that is known to help prevent numerous inflammatory diseases. Regular consumption of navy beans can reduce the risks of you suffering from diseases like asthma, arthritis, Parkinson’s disease, and other inflammatory conditions. The beans amazing anti-inflammatory properties help ensure the proper functioning of your body’s bones and joints. If you are obese and need to reduce weight, navy beans are a must in your diet. The beans are a complete diet food as they are full in fiber, low in calories, and they contain low fat and also have a complex form of carbohydrates. The benefit of eating complex carbohydrates while trying to lose weight is that it takes longer to digest, which is why you feel full for a longer period of time. Being a complex carbohydrate. Navy beans also provide your body with the required energy to do work with minimal calories to slowly and surely lose weight. The high copper levels of navy beans also mean that the beans are antioxidant rich. This is because copper is an effective antioxidant, which is crucial for the natural maintenance of your skin’s health and radiance. Not many people are aware of the fact that navy beans can actually help protect, and even reduce the chances of cancer in your body. It’s all because the beans are rich in manganese and vitamin K. Manganese is another antioxidant that helps reduce free radicals present in the mitochondrial cells. Its vitamin K, in turn, protects your body from possible oxidative stress to reduce the chances of cancer. As the beans are a rich source of antioxidants, they are very helpful at controlling any possible early cell damage. This, in turn, helps promote the cells’ longevity and can help reduce the early signs of aging like fine lines, patches, and loose skin. People who are susceptible to osteoporosis due to heredity, obesity or low calcium levels should try to include as much navy beans to their diet as possible. The beans are rich in proteins, soluble fiber and minerals like zinc, magnesium, and potassium which are very helpful at preventing the onset of osteoporosis. Vegetarians are always looking for a rich protein source. Navy beans should help them as they are rich in proteins which are essential for the development of healthy and strong bones. Not only vegetarians, but even those with cholesterol problems who cannot eat fat-rich red meats can also opt to consume navy beans for their proteins. Navy beans should be an integral part of your diet if you have a fracture as they help in your recovery process. The beans are rich in calcium, folate, and magnesium which are necessary for maintaining the right levels of homocysteine in your body. This not only helps in the healing of a fracture but also helps lower the possibility of your suffering from a hip or bone fracture. As navy beans have complex carbohydrates with a low GI index, they prove helpful at lowering your blood sugar levels. It’s also helpful including the beans in your diet if you have a history of diabetes in your family as the beans can help prevent the risk of diabetes too. There is a very high chance of free radicals forming in your body, and one of the best ways to get rid of them is through navy beans. Navy beans are rich in antioxidants, which mean they are effective anti-cancer agents which are effective at detoxifying and eliminating harmful free radicals. They, in turn, work as a shield that protects and reduces the risks of cancer and other similar related chronic body problems. The soluble and insoluble dietary fibers of navy beans make them helpful in reducing the bad cholesterol levels in the body. Adding the beans to your diet helps reduce the amount of bile acid that forms in the liver. In addition to all this, the beans also help increase the body’s good cholesterol or HDL levels. The high vitamins and minerals content of navy beans help at improving your liver health. It is the beans high antioxidant properties that help flush out the toxins from your liver. Navy beans are also helpful at maintaining your blood pressure levels. This is due to its high levels of soluble fiber, potassium, zinc, magnesium, and protein. Another skin benefit of navy beans is its ability at fighting dark circles and wrinkles. It is because the beans have natural fillers which play an important part in removing wrinkles from your skin. In the process, the beans can also help in the reduction and consequent removal of dark circles surrounding your eyes. Now that you know these 18 benefits of navy beans, it’s essential you know that you have to soak the beans in water overnight before cooking and eating them the next morning. This helps in easing digestion of the beans, and absorption of its vitamins, minerals, and antioxidants.